Learning to read is one of the most important and rewarding life skills that childhood can give us, and there's no better way to cultivate a love of books and learning than by gifting a young family member a bookcase. This range of bookshelves - available in your choice of size - brings everything a growing appetite for knowledge and adventure needs throughout the years, offering adjustable shelves that can be customized as tastes change from picture books to classic novels. The solid wood that comprises every piece of the bookshelf will ensure that no matter how many different phases and tastes and authors the lucky owner moves through, their bookshelf will always remain strong, beautiful, and reliable, proving itself to be a dependable character in their very own story. 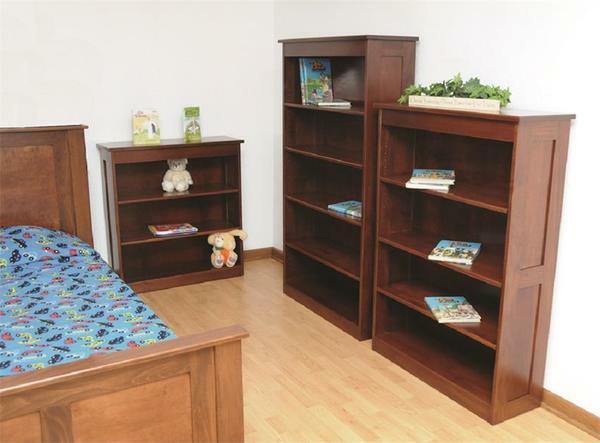 Every element of these delightful bookcases is crafted and finished by hand right here in the USA. The woodworkers who carefully construct each piece take an enormous deal of pride in the beauty and durability of the bookshelves they create, promising you one-of-a-kind quality and unbeatable attention to detail. Use the menus above to choose your idea bookshelf size and style, and if you run into any questions at all, please don't hesitate to get in touch with us - we would love to help bring your family's literary ambition to life in every last detail. Height: 36", 48" or 60"
Price includes one bookshelf; three are pictured for scale.